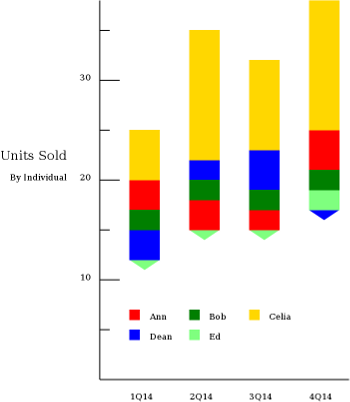 Box plots are sometimes used to represent a range in a single value, but I am curious if a similar presentation would be useful in representing an overlaid column chart. By using the same color as the background for the minimum height column, the other columns can be made to float. For a two-value overlaid column, the impact seems strong, making it very clear which item is larger and by how much. With three values, clarity seems to noticeably decrease. Even adding a marker to indicate the missing column may not make the interpretation clear, though this presentation does seem to dramatize difference. A comparison to a consistently intermediate value might be practical, but it then seems necessary to clarify that the lower bar descends to the value. This also seems to assume that the deficit/surplus quantity is significant. With five values, the distortion effects seem significant since the comparisons are much less simple. 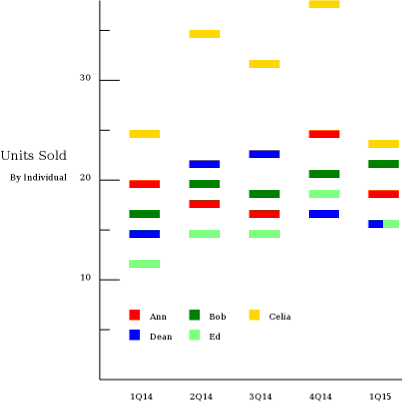 Even so there might be some datasets and purposes where a floating column chart with more than three values provides appropriately greater emphasis than a dot plot without confusion or deception. 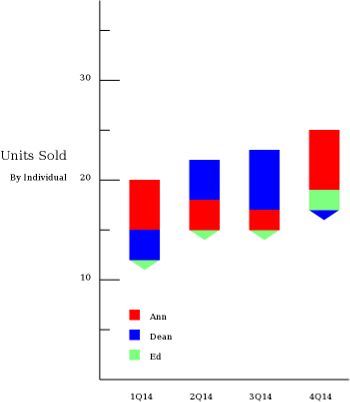 Under what circumstances — if any — would such floating column charts be useful versus dot plots or more traditional (overlaid or adjacent) column charts? How can the legend, fill choices, and other design elements make clear the overlaid nature, especially when comparing a larger number of values? ...in that even figures can be well represented. 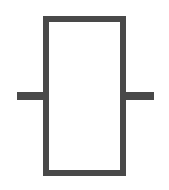 It's basically your floating example with the bars removed, to which I've appended a column. More info: median or average, can be added. It appears like a spectrum analyzer. 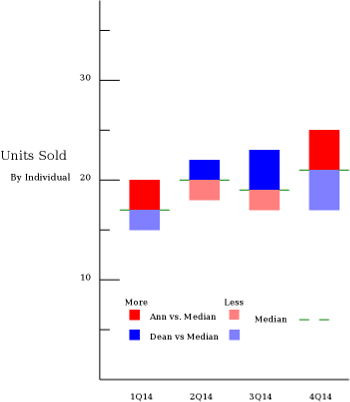 Box plots have a more constrained representation of data, and it's difficult to compare two sets of data within one block. But they are attractive. 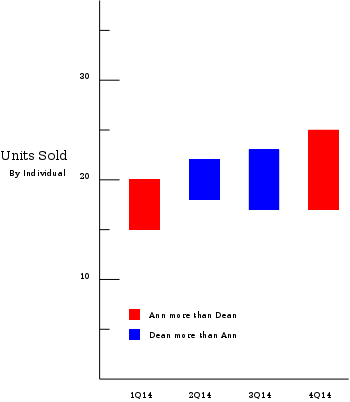 Here is depicted a single box plot. When visualized as real estate, you realize there is a limited amount of progression that can be achieved with it. You can fill it with dots, stars, or horizontal bars to indicate data within its minimum and maximum, but you would be duplicating what you would normally accomplish outside of it with some other sort of plot. So the box is a container, which works great at representing a single set of data as a tri-partite. With the implication that each salesperson is a distinct set of data, it's probably difficult to squeeze all of them into that mold. Of course, this doesn't answer your question. "whose unit is consistent but whose value varies moderately"
It's useful in portraying sports performance. For instance, in an auto magazine to represent auto performance in competitive comparison. The idea is to exceed the bar of one's lesser opponent. To survive, to surpass, to win election. A very competitive and dissonant idiom. You might find it useful sometime. Good luck. Innovative pie chart? Is there any graph that can be used instead of pie chart?